It’s time to start making Bitcoin environmentally sustainable. When Satoshi Nakamoto created the digital currency Bitcoin, he also decided there would never be more than 21 million coins. These coins would slowly be released over time, as a reward for those participating in the block creation process for Bitcoin’s underlying blockchain. Satoshi described the “steady addition of a constant of amount of new coins” as “analogous to gold miners expending resources to add gold to circulation”, and noted that “in our case, it is CPU time and electricity that is expended”. It is unknown whether Satoshi, while writing this, ever envisioned the energy-hungry nightmare Bitcoin has become. Over the full year of 2018, Bitcoin miners were responsible for a total electrical energy consumption of at least 40 terawatt-hours (TWh). This is equal to the amount of electricity consumed in a country like Hungary, and 20 percent of the total amount of electricity consumed by data centers worldwide (200 TWh per year). The latter number includes the electrical energy consumed by data centers responsible for processing transactions of the global banking industry. It is unknown what part is used for banking exactly, but even if we attribute everything to the banking industry, extreme differences in operating scale ensure that Bitcoin isn’t looking good in comparison. Minimum and estimated Bitcoin electrical energy consumption over 2018 (source: BitcoinEnergyConsumption.com). The methodology for both approaches is detailed in the peer-reviewed academic article “Bitcoin’s Growing Energy Problem” published in Joule on May 16, 2018. The global banking industry processes around 500 billion of non-cash transactions per year. With a total energy requirement of 200 TWh, that results in an maximum energy footprint per transaction of 400 watt-hours (Wh). This would be an extreme number given that a single VISA transaction has an energy footprint of ~1–2 watt-hours (VISA as a whole only requires 0.20 TWh per year, and its data centers make up for half of that amount). At the same time, Bitcoin processed only 81.4 million transactions in 2018. This puts the minimum energy footprint of a Bitcoin transaction at 491.4 kilowatt-hours (kWh), more than 1,200 times the maximum footprint of a traditional non-cash transaction, and more than 250,000 times the footprint of a VISA transaction. This utterly disastrous performance should be no surprise. Every second of the day, the Bitcoin network is running through 45 quintillion (45 * 10^18) hash operations. This is part of the process for creating new blocks of transactions for Bitcoin’s blockchain. With 81.4 million transactions per year the amount of transactions processed every second is, however, only 2.58. That’s a ratio of more than 17 quintillion to one. Bitcoin proponents have subsequently started to argue that, even though the network might require a huge amount of electricity, the environmental impact of this is limited. According to them, the network utilises excesses of renewable energy, mostly in the province of Sichuan in China, that would otherwise go to waste anyway. As a result, the environmental impact of Bitcoin mining would be negligible. Regardless of whether this is true or not (no serious support is being provided), the claim wouldn’t hold true even if most miners were indeed located in Sichuan. Part of the story that Bitcoin’s proponents won’t tell is that the production of hydroelectricity in Sichuan is extremely volatile, and excesses are therefore temporary at best. During the wet summer months the production is three times higher than in the dry winter months. This is a problem that concerns renewable energy in general. The sun isn’t always shining, the wind isn’t always blowing, and droughts limit the availability of hydropower. Renewable energy production is volatile by nature. At the same time, a Bitcoin miner will always have a constant year-round demand. A Bitcoin mining device, once switched on, will not be shut down until it either breaks down or becomes unprofitable. A miner simply cannot afford to shut down, as new machines are constantly being added to the network. This quickly dilutes the income a mining device can generate (as the fixed block rewards have to be shared among more machines). Shutting down, even for a brief period of time, results in an unrecoverable loss of income. Bitcoin network total hashrate versus the average amount of Bitcoin expected to be generated per day, by several types of Bitcoin mining devices. As more machines are introduced into the network, the proportional share of a single device (and therefore potential generated income) falls rapidly towards zero. This makes renewable energy production and Bitcoin energy demand fundamentally incompatible. In Sichuan, the fluctuations in hydroelectricity production are usually balanced out with coal-based energy. In fact, new coal-based power plants are still being constructed to this purpose, and the presence of Bitcoin miners will only be an extra incentive for this (or for keeping existing ones open). Sichuan cannot import cleaner electricity from more remote locations due to poor grid infrastructure; the same reason why the temporary excesses of hydroelectricity exist in the first place (as there’s no proper export capacity). It should be no surprise that the carbon intensity of purchased electricity in Sichuan is much higher than, for example, in Sweden (where generated power is generally nuclear or hydroelectric). The emission factor of electricity generated in Sweden is at around 13 grams of CO2 per kWh, the emission factor of purchased electricity in Sichuan is at least 265 grams of CO2 per kWh. Hence the renewable energy going into the Bitcoin mining network cannot be considered “green” either. If all Bitcoin miners would be located in Sichuan, Bitcoin’s minimum energy footprint of 491 kWh per transaction would still translate to a carbon footprint of 130 kilograms of CO2 at the very least. That’s equal to the carbon footprint of driving 500 miles in a Tesla model S, or consuming almost 5 kilos of beef. Per transaction. In the most optimistic scenario. By comparison, a Google search only equates to 0.8 grams of CO2, and a VISA transaction to 0.4 grams. Have you ever tried eating ~0.015 grams of beef? The other thing Bitcoin’s proponents are turning a blind eye to is that, no matter how “green” the energy going into Bitcoin mining, the network still has an ugly electronic waste footprint. The machines used for Bitcoin mining are mostly Application-Specific Integrated Circuit (ASIC) miners. As implied by the name, they are hardwired for a singular purpose and thus cannot be repurposed after their useful lifetime. Like most electronic waste (globally only 20% is recycled), they will end up on environmentally damaging landfills and incinerators afterwards. The whole Bitcoin network produces as much electronic waste as a country like Luxembourg, and each unique Bitcoin transaction carries an electronic waste footprint of a staggering 135 grams (equal to four standard sixty-watt light bulbs). That’s at least 30,000 times greater than a very pessimistic estimate for the electronic waste footprint of a VISA transaction (assuming each VISA server weighs 100 kilograms and gets replaced every year). No amount of “green” energy will solve this. There’s no way to put a positive spin on this. One could only argue that developments like the so-called Lightning Network (a second layer solution for scaling Bitcoin) may assist in reducing the environmental footprint per transaction, but this will certainly not be case in the near future (if at any point at all). A recent “proof of concept” on the Lightning Network, Lightning Pizza, can only be considered a failure. Only ten percent of the orders placed on the first day were successful, the other ninety percent failed. These numbers will have to turn around if this is to be taken seriously as a payment system. But even if the Lightning Network magically started to work properly, a reduction in the environmental footprint per transaction is not a foregone conclusion. Increasing use of lightning transactions should correlate with an increase in both Bitcoin adoption and the value of Bitcoin, and therefore with increasing capital and energy expenses by miners. Only a 100,000% improvement of the current network throughput, without any material increase in the value of Bitcoin, would be a good start to bringing the footprint per transaction back to an acceptable level. Another argument, that Bitcoin’s mining mechanism offers unmatched security, is simply false. Mining-based cryptocurrencies have been plagued by majority attacks over the last year, including successful double spends on Bitcoin Gold and Ethereum Classic. In Bitcoin itself the supposedly superior security mechanism could not prevent CVE-2018–17144, a critical bug that could have allowed a Bitcoin miner to inflate the Bitcoin supply. As the bug made its way into the code due to a lack of proper testing, it showcases that even a multi-billion-dollar currency, secured by an extremely energy-hungry network, can still have an amateur hour moment in its development. Perfect security does not exist. Lastly, it’s also unclear if Bitcoin’s mining mechanism could sustain itself long-term. A report by the Bank of International Settlements described significant economic problems in Bitcoin’s design. 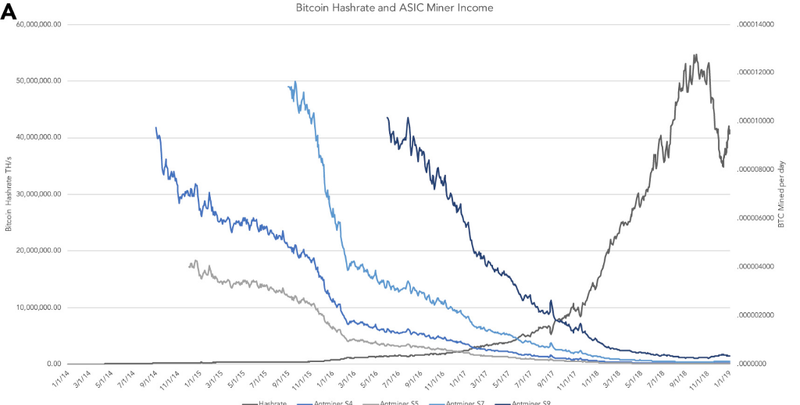 Falling miner income would cause “liquidity to fall dramatically”, and as a result it “could take months before a Bitcoin payment is final”. The solution for the latter would be to switch the confirmation process to the Proof-of-Stake protocol. The same switch would also be required to solve for Bitcoin’s environmental impact. Proof-of-Stake does not depend on computational power, hence there is no incentive to spend extreme amounts of electricity or develop specialised (single purpose) hardware. Alternatives like these, currently used by various cryptocurrencies already, show that blockchain technology can be “green” even in the public domain (private blockchains generally don’t make use of mining at all, so the environmental impact isn’t a concern for these). The Bitcoin community only has to follow the example already set by others. Until then, there’s no escape from the currency’s disastrous environmental performance. This story is based on a new peer-reviewed academic article “Renewable energy will not solve Bitcoin’s sustainability problem” published in Joule on March 14, 2019. I work for PriceWaterhouseCoopers, an accounting and consultancy firm that serves both the banking industry and blockchain/cryptocurrency start-ups. 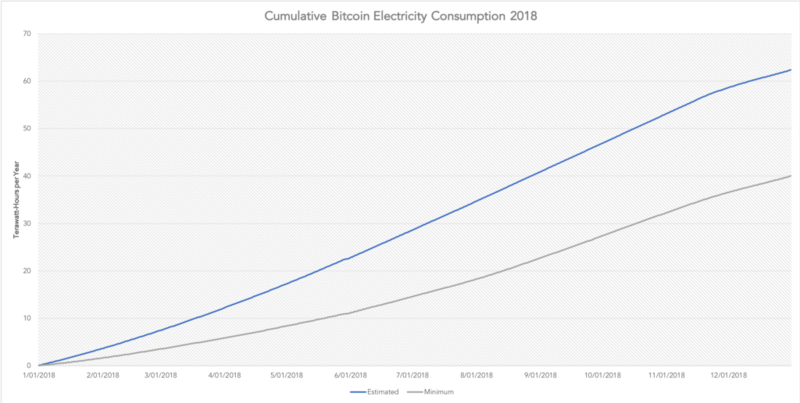 Last year I correctly predicted (in another peer-reviewed article titled “Bitcoin’s Growing Energy Problem”) that the energy consumption of the Bitcoin network work grow to equal the electrical energy consumption of Austria in 2018. I hold no cryptocurrency investments. Bitcoin’s inescapable, inconvenient truth was originally published in Hacker Noon on Medium, where people are continuing the conversation by highlighting and responding to this story.